In 1997, Daleon Enterprises took out a licence with EON Productions to produce a reproduction set of the very first James Bond trading cards. The cards had previously caused quite a controversy in the UK because of the abundance of photos depicting scantily-clad Bond girls deemed unsuitable for children. Thus, the company recalled the original sets and substituted more benign photos. The Daleon set reproduced the original "banned" set of cards exactly as they appeared in 1964. Additionally, the set contained bonus cards detailing the controversy that occurred when they were originally released. This limited edition reproduction set is uniquely packaged in a plastic replica of an attache case! 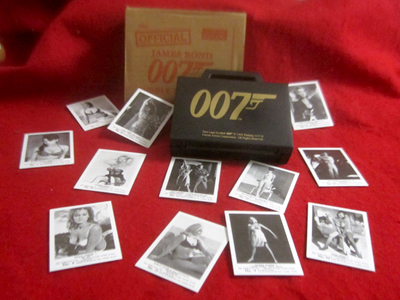 "Released in 1964 and simply called 'James Bond 007 Chewing Gum', this set of 60 B&W photo cards depicted scenes from the first three 007 movies, Dr. No, From Russia With Love and Goldfinger. Produced by Somportex of London, the cards were actually manufactured by Dandy Factories in Denmark. Each packed contained three cards and a piece of chewing gum. If the customer sent twelve of the wrappers to Somportex, they received a free 007 badge, which is also a collector’s item! Originally, card #25 was printed twice- with Shirley Eaton in different poses! Also, card #58 can be found with and without the number 27 printed in the bottom right-hand corner. These cards were withdrawn from sale in 1965 after front page headlines in the Daily Mirror reported that a member of Parliament complained that the photo content of bikini-clad girls was 'a disgusting and disgraceful corruption of young children.' Somportex immediately issued a new, 50 card set- this time without the pin-ups!" Now MI6 Confidential has access to a very limited number of these rare reproduction sets from 1997, which were limited editions. They are available for $42.95 (free postage in USA/ $14 postage outside USA) whilst stocks last.